Manatees on Florida's East Coast hit a new record high of 3,731, topping last year's record high of 3,488, according to the Florida Fish and Wildlife Conservation Commission. FWC reported a preliminary count of 6,131 manatees in Florida during the 2018 statewide aerial survey which is conducted annually in late January. A team of 15 observers from 10 organizations counted 3,731 manatees on Florida’s east coast and 2,400 manatees on the west coast of the state. This year’s statewide count of 6,131 manatees is down from last year's record count of 6,620. However, it is still the third-highest count since record-keeping began in 1991. Florida's west coast saw a drop from 3,132 in 2017 to 2,400 in 2018, the lowest count since 2010. But the 2018 west coast count remains the seventh-highest on record. Florida's manatee count has exceeded 6,000 manatees for the last four years, which is more than double the count 15 years ago. As a result of the manatee comeback, the U.S. Fish and Wildlife Service removed the manatee from the Endangered Species List because studies showed that it is unlikely the manatee population will fall below 4,000 for the next 100 years. Is The Manatee Boom Hurting The Indian River Lagoon? Many Brevard County waterfront property owners, boaters, and anglers blame the increased manatee population for the Indian River Lagoon's plight. Citizens for Florida's Waterways (CFW) contends that the manatee boom is putting too much pressure on the seagrass and nutrient load in the Indian River Lagoon. That's because an 800 to 1,200-pound adult sea cow can eat up 10% to 15% of its body weight daily in aquatic vegetation which mostly consists of seagrass. According to a U.S. Fish and Wildlife Manatee Recovery Plan, manatees sometimes graze on seagrass which leaves the possibility for regrowth - but manatees also "root" seagrass - meaning the entire plant is pulled and the underwater sediment is disturbed. 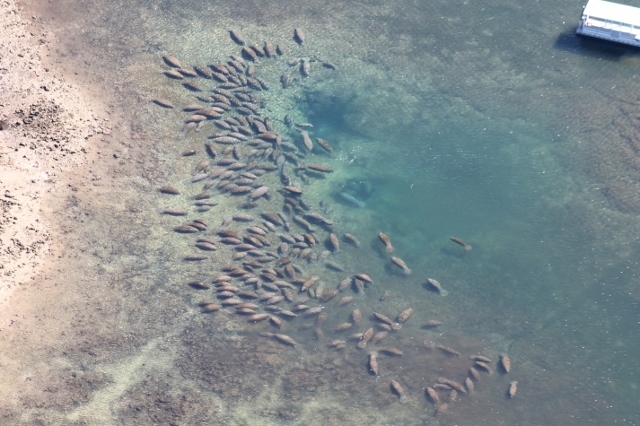 Based on those consumption rates and grazing method, CFW calculated that an average manatee can consume and/or destroy around 3 acres of seagrass a year, depending on the density of the seagrass per acre. "At the time the seagrass TMDLs were developed [in 2009], manatees were not considered as major nutrient contributors to the Indian River Lagoon because not all the data needed to quantify the manatee nutrient contribution were available. It is worth noting that manatees have been part of the Indian River Lagoon ecosystem for a long time," FDEP stated. "We have at least got [FDEP's] attention to the subject," CFW President Bob Atkins said of FDEP's analysis of the manatee's nutrient impact on the Indian River Lagoon. "My conclusion is that seagrass loss is worse [from manatee consumption] than I have calculated and free nutrients are not as bad."